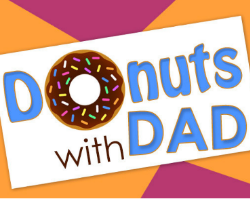 We would like to cordially invite you to a Donuts with Dad gathering! What: Kenneth Davis would like to host a breakfast to thank their dads, grandfathers, Uncles and male role models for always supporting them. Donuts, juice, and coffee will be served. When: April 6, 2018; 7:00 a.m. -7:30 a.m. Please RSVP by April 2nd! Print and send in form OR RSVP online!